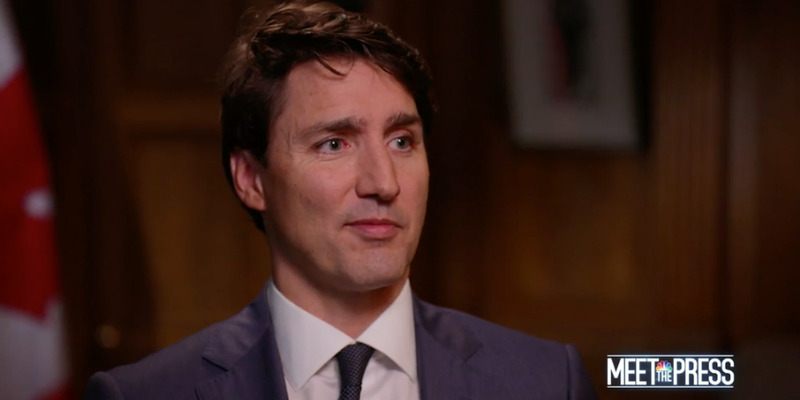 NBC NewsCanadian Prime Minister Justin Trudeau hit back at the Trump administration’s tariffs on steel and aluminium imports during an interview with NBC that aired Sunday, June 3, 2018. In an interview with NBC’s Chuck Todd on “Meet the Press,” Canadian Prime Minister Justin Trudeau hit back at the recent tariffs implemented by President Donald Trump against Canada. The Trump administration had triggered talks of an impending trade war after Commerce Secretary Wilbur Ross on Thursday announced that exemptions from steel and aluminium tariffs on imports from Canada, Mexico, and the European Union would expire on Friday. Steel imports from those countries will now be subject to a 25% tariff, and aluminium imports will be subject to a 10% tariff. As justification for the move, the Trump administration cited a law that allows tariffs to be imposed on a country in the interests of protecting national security. Canadian officials have expressed particular frustration with the Trump administration’s actions – and Trudeau wasn’t the only one to speak out on American Sunday shows. Trudeau also warned his American counterpart that implementing new tariffs won’t just hurt Canada – it will hit America’s labour force as well. Canada announced last week it will impose retaliatory tariffs on $US12.8 billion worth of US goods in response to Trump’s metals tariffs. But the Trump administration sought to downplay Trudeau’s comments on Sunday. White House economic adviser Larry Kudlow likened the Trump administration’s dispute with the Canadian government to a “family quarrel” during an interview on Fox News Sunday.